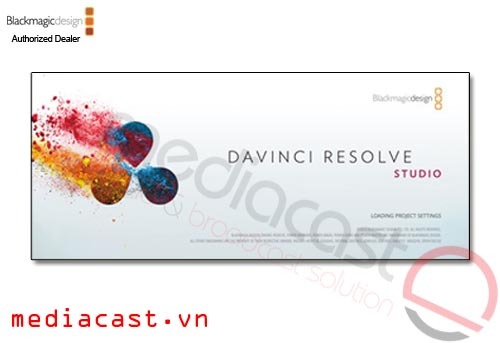 Blackmagic Design Davinci Resolve Studio là phần mềm hiệu chỉnh màu mạnh nhất, phổ biến nhất được sử dụng trên thế giới. DaVinci Resolve Studio, from Blackmagic Design, is a renowned advanced color correction software and now also a full-fledged, non-linear editing system — it even allows to you to import projects from other NLEs, such as from Premiere Pro, as XML files. You can edit, color correct, finish, and deliver all from one system. Moreover, Resolve is highly sophisticated and oriented at the same time toward the individual user, large collaborative teams, and the growing studio owner. It's completely scalable and resolution independent, so it can be used on set, in a small studio, or integrated into large production pipelines. Resolve is scalable and supports multiple GPUs all working together. You can use multi-GPU systems such as the Mac Pro or build a dedicated Windows system with up to 3 GPUs or Linux system with up to 8 GPUs. Resolve also features advanced media management tools designed for editorial and color workflows. You can move, copy, consolidate, relink, and archive media, timelines, or entire projects. Resolve's clone tool will back up your valuable camera files on location so you can copy camera files to multiple destinations with checksum validation for safekeeping while you're still on set. Resolve is also capable of editing metadata, syncing sound, and prepping footage for editing, grading, or visual effects. Resolve supports almost any format, and also includes powerful delivery options for versioning, finishing, and delivery at any resolution and format, so you can export for various destination types. Resolve works from your camera originals so your finished master is a first generation graded copy of the original camera raw files. Additionally, exporting can take advantage of remote rendering, using another Resolve on the network to render the job. Resolve was designed with the ability to integrate with dozens of other applications so that you can focus more on your project. Resolve can share sequences and round trip projects with Final Cut Pro X, Media Composer, Premiere Pro, and other editing, audio, and VFX and motion graphics software. You can edit your project on any system, then link back to your full quality camera raw files using XML, AAF, or EDL and finish in greater bit depth with Resolve. You can also use AAF export to send a project to ProTools with discreet audio clips and a single layer video mix down for audio finishing. Get support for multiple GPUs, 4K output, motion blur effects, temporal and spatial noise reduction, 3D tools, remote and multi-user collaboration tools, and more with DaVinci Resolve Studio. For an even more enhanced workflow, you can incorporate the optional Resolve Advanced Panel, which is an award-winning control surface for more precise color correction. Node based processing; each node can have its own color correction, etc.